Like every type of app, there are a lot of e-book reader apps available for Android on the Play Store, and each allows for multiple customization options. So what does a new e-book reader app have to do to differentiate itself? In case of Fabrik reader, it’s working great out of the box and allowing you to sync your e-books with Dropbox. The Dropbox integration in Fabrik allows you to sync your e-books with your Dropbox account, including the reading progress of a particular book, allowing you to resume reading from where you left off on all your Android devices. Fabrik also focuses on a great experience right out of the box without the need to go through preferences and options, and has a beautiful textured background which gives it a really premium look. E-book formats supported are txt, ePub and mobi formats, with support for more coming in future updates. 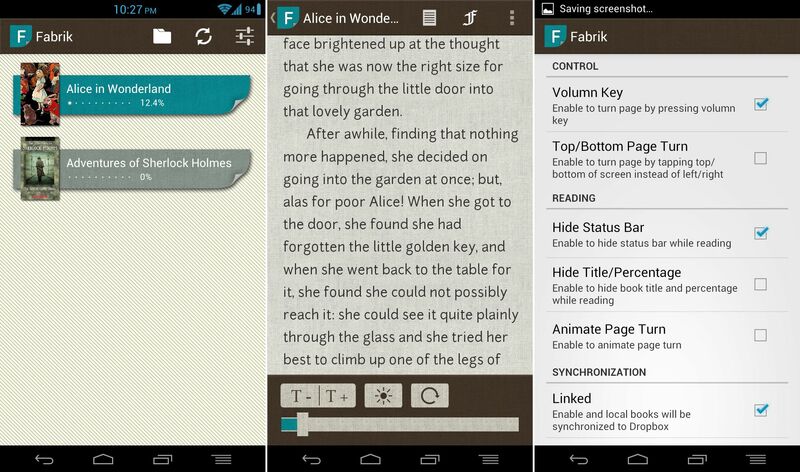 Features like scrolling through pages with the volume buttons, sliding up and down on the screen to change brightness levels, ability to share your reading progress with others make Fabrik quite a unique and different e-book reading experience on a smartphone or tablet. Hit the link below to download Fabrik from the Google Play Store, and enjoy reading those e-books!